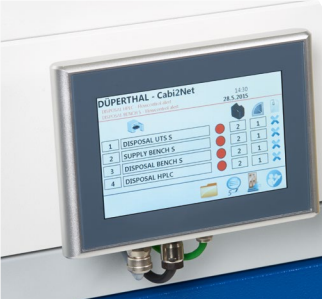 Fire-proof safety storage cabinets by DÜPERTHAL offer a reliable fire protection of 90 minutes. 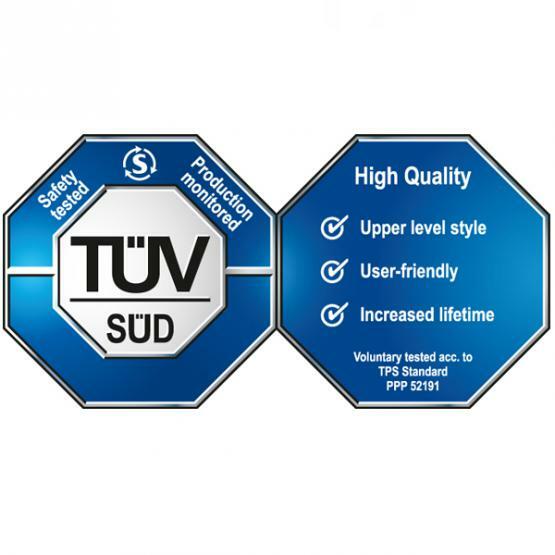 In case of an emergency, this protection provides enough time to evacuate the building and to extinguish the fire safely and thoroughly. 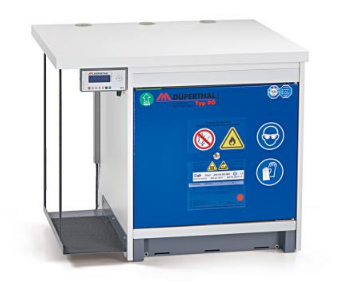 The HPLC service station Type 90 from DÜPERTHAL is the professional solution for active storage. 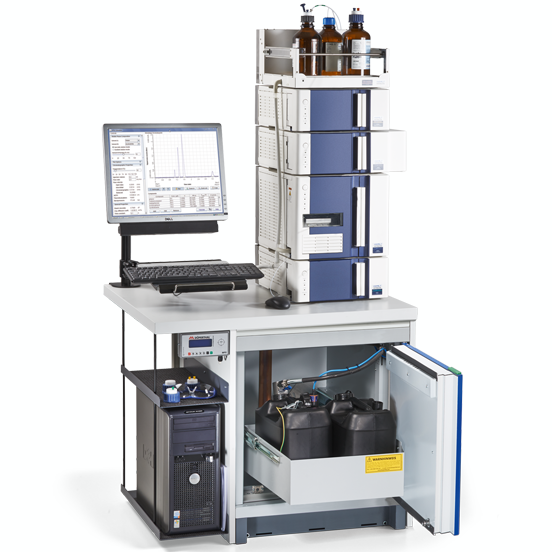 It is specially designed and constructed for the collection of wastes from high performance liquid chromatography. 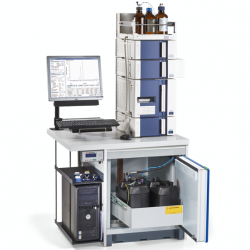 For a period of up to two weeks, the HPLC service station collects all volatile and flammable substances for safe storage at a flow rate of 1ml/min. 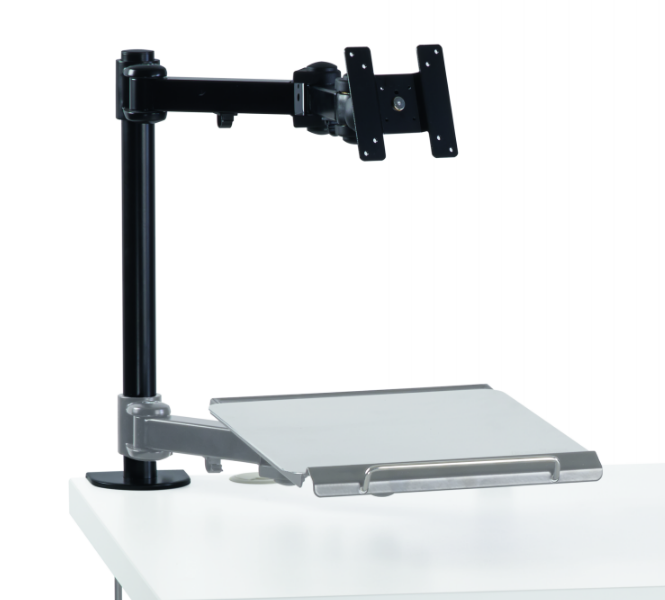 This enables flexible workflows and a more efficient design of the in-house value creation chain. This effectively leads to the release of resources that may be used for other active and target-oriented exploration in research. 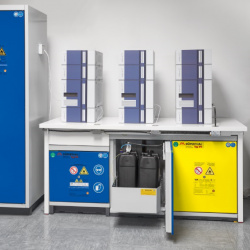 The HPLC service station is a complete system that incorporates the UTS Ergo line S undercounter safety storage cabinet with pull-out trays and comes with its own service rack and inner carcass made of high-quality décor panels. The wing door and outer carcass is constructed in conductive powder-coated sheet steel. 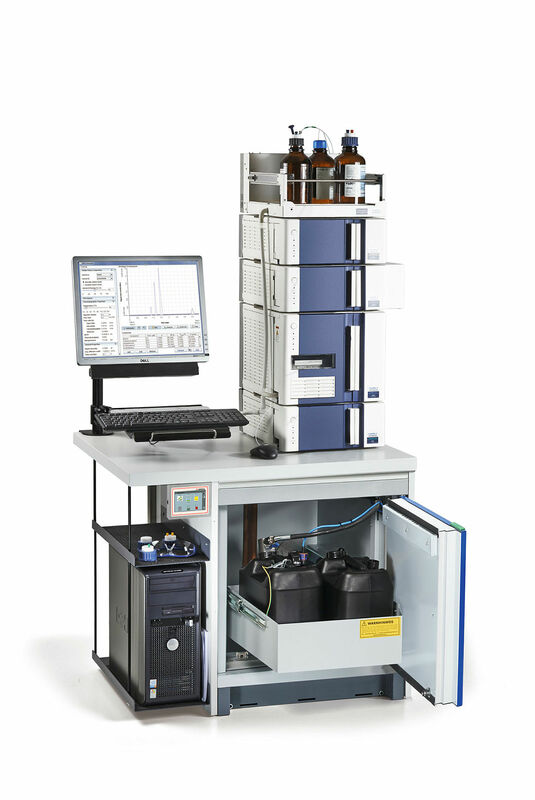 Integrating the HPLC service station into your workplace guarantees your compliance with essential safety laws, codes of regulations and directives. New improvements to the HPLC service station include a PTFE hose, replacing what was previously a plastic one, that was at risk of breaking when flexed. The PTFE hose is also electrically conductive so that there is no risk of static shock that could ignite a flammable liquid. 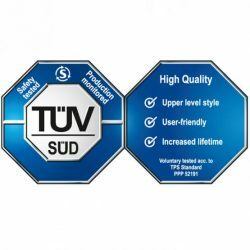 The corrugated tubing has also been replaced with one that features a smooth, level interior, to eliminate the risks of flammable liquid assembling in ridges when opening and closing the door of the cabinet. 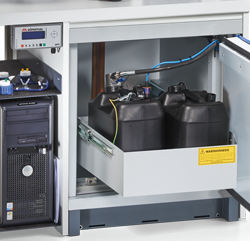 The HPLC service station makes your work easier and safer with a range of versatile additional functions specially designed for the storage of flammable wastes. 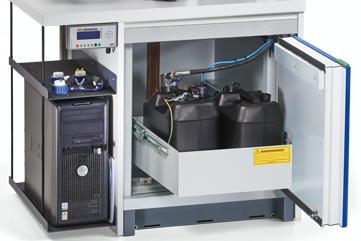 Like other safety storage cabinets in DÜPERTHAL’s Type 90 range, the HPLC service station combines laboratory storage with maximum fire resistance and is type-tested in accordance with DIN EN 14470-1 and the laboratory furniture standard DIN EN 14727. 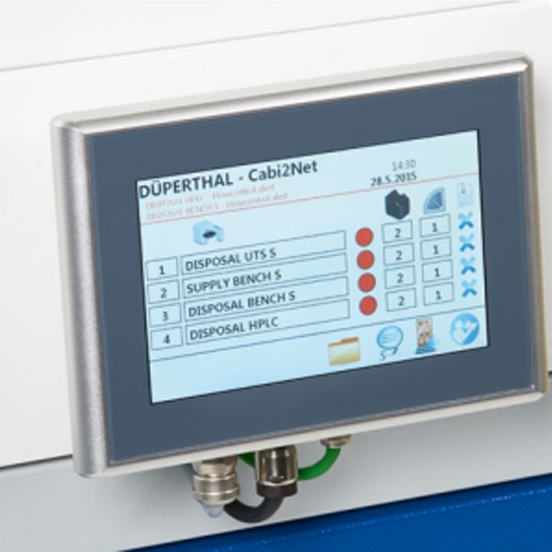 Düperthal have released their new intelligent software option, Cabi2Net. 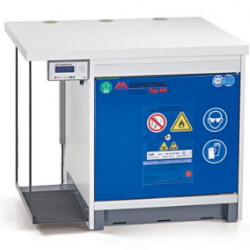 There are 80,000 options available with this feature, that includes an SMS or email notification if a door is left ajar, or an alarm for increased, heated temperature or vapors in the air of your laboratory. 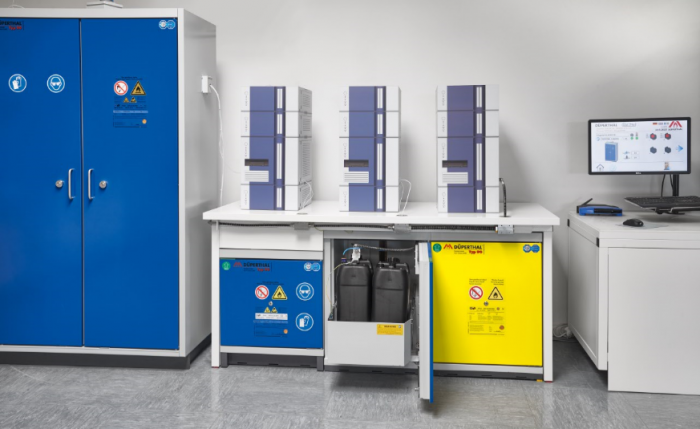 More security measures can also be customized, including a lighting system on your laboratory wall that displays a red light if a door is left open. Everything in this system is actively documented and allows you to generate a report to show exactly what time the door was left open. Access to the system is not limited to the internal network of your organization. Because it is web compatible, you can receive real-time alerts even whilst in another country. The Cabi2Net system can be connected to up to 120 cabinets.